We used to make these cupcakes quite often several years ago when my son was 9 or 10. It was always his delight to mix the “color” for the frosting. And you can imagine with a 9 year old mixing colors we had some interesting looking cupcakes back then, to say the least. Although I am not a fan of using “food coloring” in cooking, I do make an exception for these because they are so festive and exuberant. This recipe comes from one of my favorite cookbooks “Apples for Jam” by Tessa Kiros. I love how she organized her recipes in the book according to color of the food. She offers some very good cooking advice as well as subtle attention to preparing meals with children in mind. Tessa’s cupcakes are “tiny and pink”, and as you can imagine pink was always out of the question for the young man. I had a little leftover mascarpone and decided to whisk up a small batch of frosting too. The mascarpone frosting was so creamy and fluffy, delicious and buttery rich! Preheat oven to 350°F. In a large bowl beat together the butter and sugar. Add the eggs one at a time, beating well. Add the vanilla, then sift in the flour and baking powder. Mix well while adding the milk a little at a time. You should have a thick and creamy batter. Spoon the batter into paper cupcake liners. Make sure to only spoon in enough so the cake does not puff up above the liner top when baked. The icing sits on the top nicely when the finished cake is level with the top of the liner. Place the liners into a muffin tin and bake for 15 minutes or until a toothpick comes out clean. Cool completely before frosting. For the icing, put the confectioners sugar in a mixing bowl with a few drops of food coloring. Gradually stir in approximately 4 tablespoons of cold water and stir until your have a smooth, yet thick consistency. Drop about one teaspoon of icing on top of each cake and smooth around with the back of the spoon. (If the icing starts to thicken too much add a little more water to thin it out.) Sprinkle any decorations on before the icing dries. For the mascarpone frosting, using a mixer fitted with a whisk, mix Mascarpone cheese and butter until light and fluffy. Add the confectioners sugar and vanilla and continue to whisk until well mixed. Oh how cute! I have Apples for Jam too, as well as Falling Cloudberries and Venezia; I agree they are lovely, particularly her colour coding of recipes from her childhood. Very interesting post. I also like the idea of a cheese frosting. The cheese frosting sort of just happened, wasn’t planned, as I had a bit of left-over mascarpone. They were a bit too rich for me, but tasty! Always enjoy your posts–the variety is fun as I never know what I’ll be reading about! I love your daughter’s cake! Thank you for sending the link, so adorable. And thank you for your ever-so kind and thoughtful comments. Thank you so much. I haven’t had much time to breathe lately! Hopefully things will start to slow down so I can do some catching up. Very nice of you to “check in” :) I’m headed your way right now! Thank you. Love this blue too. Beautiful, nostalgic and, did I say, delicious? It really was nostalgic for me Fae! We hadn’t made these in a few years and it brought back all kinds of memories. Thank you so much… I treasure his artwork from the early days. He had four or five years of art classes. The work he brought home is all so wonderful and many of it is placed on our walls. It was a very fun class for him and to be able to work with beeswax was extra special. These look delicious!!! I used to love it when my Mom brought out the food colouring at Christmas. The blue is beautiful. That’s it! The same in my family. We only use food coloring during Christmas time and baking too! Thank you! Very cute cupcakes! I really like the frosting though…yum! Thanks Suzie! 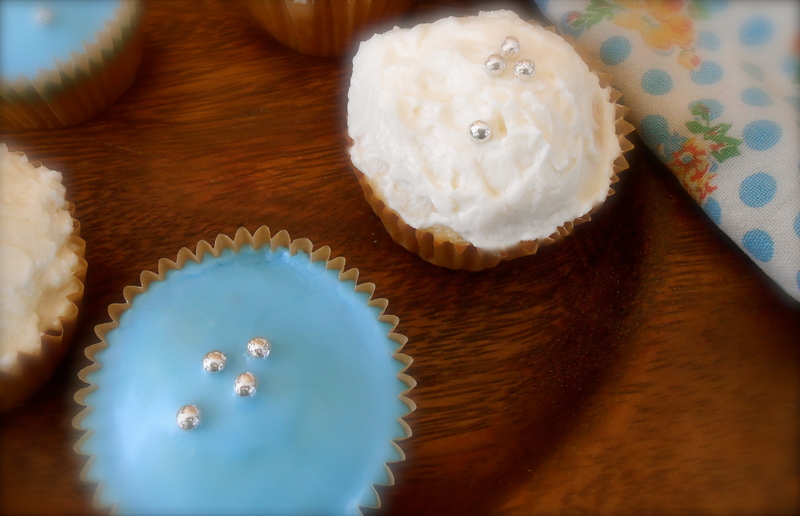 Cupcakes always make me smile…even if I can not seem to finish off a whole one. They are so festive and “cute’ is the perfect word to use. Very true….as I sit here under grey skies! I actually prefer mine without frosting too. I kept a few unfrosted just for me! :) I remember the silver cachous from my childhood too! We have some things in common…. I just realized how “color” oriented this post is! Thank you for your nice compliments. I could never paint anything close to this myself, he has quite a talent when it comes to drawing and painting. 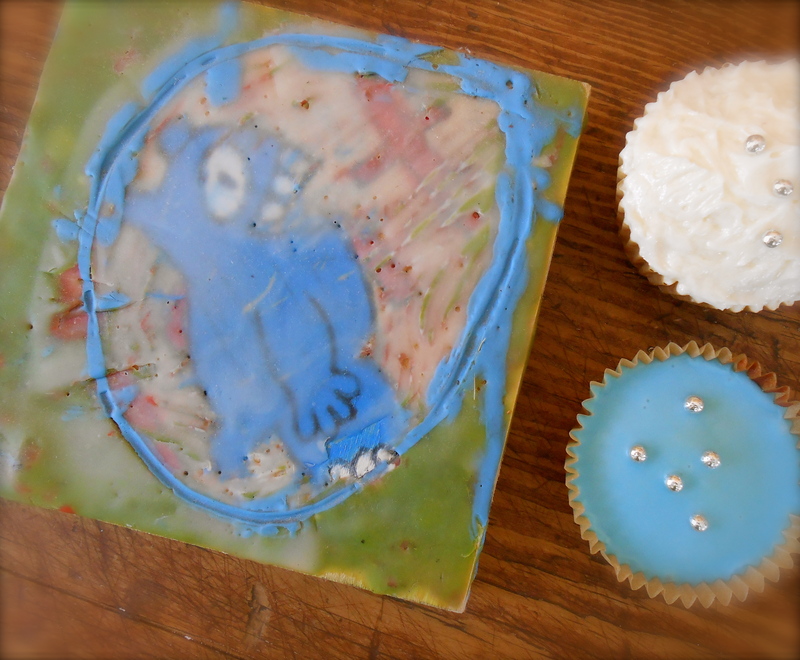 I LOVE that encaustic! Tell little T that a “professional art student” says it’s fantastic ;) Speaking of, these cupcakes are so elegant and festive. Love that blue! It reminds me of wedding showers, baby showers… very old-fashioned! You’re right. That blue is/was used for showers. I haven’t been to a baby or wedding shower in quite awhile. I love this blue hue too. TWC! I am not a fan of blue food, but you may have converted me. Those cupcakes look so elegant. You also have a reserved hand with the silver things. Makes them even more elegant. Nicely done. Might add the encaustic painting is nicely positioned. I am guessing you have an overflow of talent at your house. Seattle is loaded with hugely talented folk. Thanks Janet. Seattle does seem to be home to talented folk! :) When was your last visit? I have family that live there. I guess it was my nieces’s wedding in 2011. How pretty, they are just beautiful. I love the blue icing it’s so smooth and perfect looking. That painting by T is adorable!! Thank you…I think I love how they look more than eating them! They are way too sweet for my palate. I do leave a few “un-iced” for me. Having said that, I should say too…everyone else in the house absolutely loves them. These cupcakes look so pretty! And it’s always so much fun baking with kids! I agree. I love the eagerness and excitement the little one’s bring to the kitchen when they get their little hands into the mix! I make exceptions for food colouring with cake too :) Looks fab! Also love the encaustic. And not a fan of food colouring either but I’d happily eat one of these! They ARE adorable! Thank you Lindy. If you are anything like me you would only eat 1/2 of blue cupcake! Too rich and sweet.. :) I just had to put the little T encaustic in the photograph. The color fit so well. These are so cute! And I’ve never used marscapone in a frosting. What a fantastic idea! This was the first time I have had mascarpone frosting too. Although it was very rich I liked it in very small doses. I could see you making some of these cupcakes and decorating them like your cookies!! Those owls are fantastic! What a happy post. Who can help but smile at a blue cupcake! Love the marscapone in the frosting! These cupcakes look way too cute :-) My daughter will be turning two end of September, and know that I will be using the marscapone frosting for her party. Oh my – mascarpone frosting! I feel like I have died and gone to heaven. I just discovered mascarpone a couple months ago. I haven’t had a chance to do anything with it yet. Frosting sounds like the perfect thing to start with! Thanks for sharing the recipe. 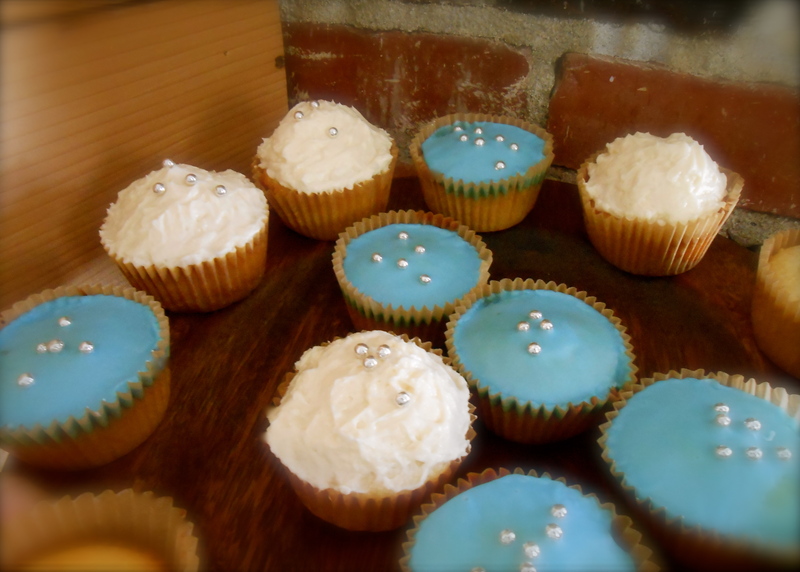 You are currently reading blue cupcakes at COTTAGE GROVE HOUSE.